How nice would it be to go back in time and correct a mistake or recover from an embarrassing moment? In Edge of Tomorrow, Tom Cruise does just that. Over, and over...and over again. By reliving the same battle repeatedly, Cruise's character learns to make himself better and smarter with the help of a former time traveler (Emily Blunt's character). Dying at every turn, the pair work together through different scenarios to eradicate an alien invasion during the last stand of the human race. After awhile, the repetition became an annoying but necessary plot device to give the humans an edge in the war. Cruise begins the film as a weak coward but returns to his old, familiar form as the hero in the film's climax. This movie was recommended to me by friends and customers at work. Unsure at first, I thought why not give it a shot and decided to go. In turn, I would say the same thing. Go give Edge of Tomorrow a chance. Sci fi and Cruise fans alike will leave the theater satisfied. After Oblivion, I was ready to boycott future Tom Cruise movies. I ended up at Edge of Tomorrow because the drive-in we went to wasn't playing The Fault in Our Stars. I'm glad I was forced to give it a chance. I was far from sold on the premise of an alien-fighting, time traveling Cruise in a mechanical combat suit, but Edge of Tomorrow turned out to be an intriguing plot with strong acting and a dash of comedy. Cruise's uncharacteristic cowardice at the start of the film captured my attention. He's a major in the world army, a man who has risen through the ranks through business, not brawn. When he attempts to desert, he's conscripted to a base camp preparing to go all in to remove the alien enemy from earth...the next morning. The assault is launched and Cruise's unfortunate character (Cage) runs around clueless. He can't even get the safety off of his weapon. Lucky for our less than combat-ready hero, each time he's killed, Cage wakes up the morning previous, back at base camp. I got the feeling with each "reset" that I was witnessing some noob respawning on a multiplayer game of Halo. And it was entertaining. The urgency and comedy in each of Cruise's do-overs resulted in a bizarre cross of Groundhog Day and Independence Day. The audience is even treated to a taste of 50 First Dates as Cruise uses his uncanny ability to hit on costar Emily Blunt. 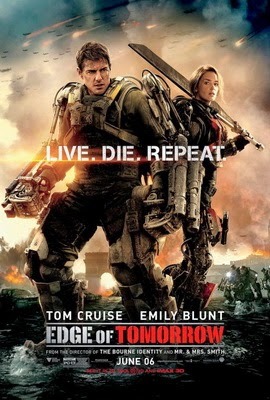 In the end, Edge of Tomorrow, brought a fresh spin to both the time travel genre and put Cruise back on track.